Successfully Added Professional OBDII + EOBD Code Reader and Scanner to your Shopping Cart. Professional OBDII + EOBD Code Reader and Scanner with LCD display screen for professional and amateur car mechanics. Most of us don't know our car has a problem until the "Check Engine" light turns on. We also have no way of diagnosing the problem ourselves, and no way to confirm whether our local mechanic's diagnosis is accurate. Now with this Professional Grade OBD-II + EOBD Code Reader + Scanner, you can enjoy the peace of mind that comes with being able to find the source of problems immediately, and resolving little problems before they turn into big ones. This Professional OBDII + EOBD Code Reader and Scanner features a wide range of functions that are perfect for professional car mechanics and newbies alike. Plug this scanner into your vehicle and begin viewing and saving live engine data right away. Use this scanner to display diagnostic trouble codes (DTCs) right on the screen, read and clear all generic and some manufacturer specific DTCs and Inspection/Maintenance (I/M) Readiness data, reset the "Check Engine" light, view OBDII Freeze Frame data (which is captured when the vehicle's on board computer detects problems), determine the Malfunction Indicator Lamp (MIL) status, retrieve the Vehicle Identification Number (VIN), scan live data from your vehicle's on board computer, and save up to 38 scans for later viewing. Your local mechanic charges you for each and every one of these tests, so you save money every time you use it. The interface of this vehicle code reader and scanner provides the data demanded by professionals but is easy for beginners to use as well. The scanner plugs directly into your vehicle's Diagnostic Link Connector (DLC), which by regulation is located within easy reach under the dashboard on the driver's side. No extra tools, connectors, or converters are required. The 3 inch screen displays not only the five-digit diagnostic trouble codes (DTCs), but also the definitions of these DTCs and the location and type of problem, so you won't have to spend time looking up the code's meaning. Professional mechanics, auto enthusiasts, and anyone concerned with the safety of their vehicle will love this product. Take advantage of our unbeatably low price to try one out today. Order in bulk to enjoy even greater savings and stock up on this code reader for your store or for undercutting the competition on eBay. From your best source of high-tech, low price gadgets, Chinavasion. Stand alone and plug and play: No need for additional batteries, cables, connectors, or converters. NOTE: This device is very user friendly, but please read the insturction manual carefully before using this product. The diagnostics code scanner is compatible with vehicles that are OBD-II compliant and EOBD compliant. The best way check if your car is OBD-II compliant or EOBD compliant is to check the car user manual or contact your local car dealer or mechanic. Is This Code Reader Compatible with My Car? This Professional OBDII + EOBD Code Reader and Scanner is compatible with all OBD II compliant vehicles. On- board diagnostics version II (OBDII) is a system developed by the Society of Automotive Engineers (SAE) to standardize automotive electronic diagnosis. Beginning in 1996, the Environmental Protection Agency (EPA) required that all cars, light trucks, APVs, MPVs, and SUVs sold in the United States must be OBD II compliant, including both domestic and imported vehicles. This code reader and scanner is also compatible with all EOBD compliant vehicles. European On-Board Diagnostics (EOBD) is a standard for cars sold in Europe. In came into effect for petrol cars sold in Europe since January 1, 2001, and diesel cars sold in Europe since 2003. Check your car to make sure your car is either OBD or EOBD compatible. Can using this scanner improve my safety? Yes. Did you know that when your vehicle's on board computer detects certain problems, it captures a "Freeze Frame" of the data when the fault was detected, assigns the relevant fault code (DTC), and stores this data in its memory. But it will not turn on a warning light until the same problem is detected on two trips in a row. With this code scanner, you can access your vehicle's stored data and resolve these problems before they occur again. Don't wait for these problems to happen two times in a row before you get this scanner. How is this model different from your CVELY-1019 "Professional Grade OBD-II + EOBD Code Reader + Scanner"? This model has newer firmware and a more complete instruction manual than the previous model. 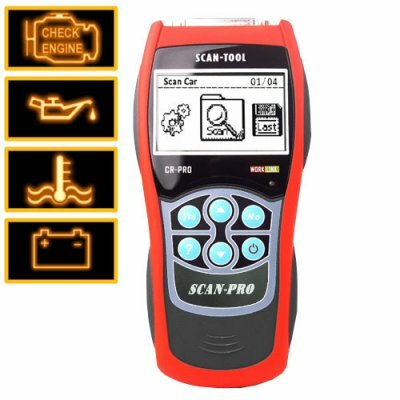 Does this code scanner work with my car? This diagnostic code scanner works on all vehicles that are OBD-II compliant. The best way check if your car is OBD-II compliant is to check the car user manual or contact your local car dealer. Can I use the CVELY-1019-2GEN to scan for an intermittent malfunction indicator lamp? Yes, to have this single scan at a mechanics will cost about 60 Euros, so this is something you can do yourself and save a bit of money. Please consult the manual carefully. There are some instances in which you should not have your car running during diagnostics. I'm not a professional mechanic, can I still use this code reader and scanner ? Yes. This code reader and scanner is designed to be user friendly and easy to use and understand. The user manual is very well written and contains all the information you will need to operate this code reader and scanner correctly and safely.